Dr. Nicole Garneau is a Curator of Human Health, the Department Chair of Health Sciences, and Principal Investigator of the Genetics of Taste Laboratory at the Denver Museum of Nature and Science. 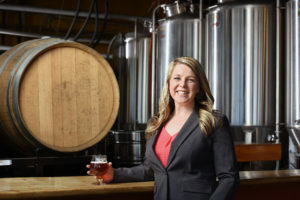 In addition, Nicole is Co-Founder of Beer Flavor Map and DraughtLab Brands, a company that creates accessible, affordable, and powerful sensory systems to help ensure quality and consistency of products for craft brewers. She also has her own speaking and consulting company called Dr. Nicole Garneau LLC. She received her B.A. in Genetics as well as Comparative Literature from Rutgers University. While in college, Nicole worked as a Research Assistant at the University of Medicine and Dentistry of New Jersey, an Assistant Research Scientist at PTC Therapeutics, Inc., and an In-Field Marketing Specialist for Pierce Promotions. Afterwards, Nicole attended graduate school and was awarded her PhD in Microbiology from Colorado State University. During graduate school Nicole Co-Founded the company Alexandra’s Baggage, LLC and she also completed a Technology Transfer Internship at Colorado State University. Before accepting a position at the Denver Museum of Nature and Science, Nicole worked on the as a consultant for MicroRx Company Promotions for CSU Ventures, Inc., and she also worked as an Investment Services Coordinator for CSU Management Corporation. In this interview, Nicole chats about some of her experiences in life and science. Nicole has a variety of hobbies and interests outside of science, including gardening, yoga, learning Spanish, visiting the mountains and rivers of Colorado, and enjoying the outdoors with her family. As a taste scientist and geneticist, Nicole is interested in understanding how the subtle differences in people’s DNA determines how we taste and choose foods. Taste is one of the main contributing factors to how we choose food, so our sense of taste can have large impacts on overall nutrition, health, and well-being. Her work on taste at the Denver Museum of Nature and Science led to her involvement in the craft brewing industry. Through the Beer Flavor Lab and DraughtLab, Nicole helps brewers use science to make better and more consistent products. In addition, Nicole is a speaker and consultant for youth organizations, as well as food and beverage companies. Growing up in Maine, Nicole was surrounded by woods and nature. She spent a lot of time outside exploring and looking at bugs. During her sophomore year in high school, Nicole’s interest in genetics was piqued when her biology teacher introduced the class to the Human Genome Project. Before this point, she assumed everything in science was already known. This was the first time Nicole realized there was still research going on in science, and there was still so much more to be discovered. That day after school, Nicole proclaimed to her mom that she wanted to be a geneticist. She found a college with a genetics program and secured a work study position in a research lab there. This experience was a lot of fun, but Nicole wasn’t convinced this was what she wanted to do for her career. In the year after graduating, Nicole worked for a promotions company, a dried bean farm, and a motorcycle shop. Each of these positions taught her important lessons and skills, and at the end of that year, she decided to go to graduate school to pursue a career in science because she was ready for a new challenge. In the fall of 2017, Nicole was faced with the untimely deaths of a friend, a colleague, and a family member, all of whom she was very close with. This series of tragedies on top of her existing challenges triggered Nicole to sink into a deep depression. She knew she had to address these issues that were really affecting her life, so she decided to come forward and talk about her experiences. Revealing this part of herself and making herself vulnerable has been difficult, but it has also helped her be more genuine and connect more with other people. It has also made her more joyful because she’s not wasting energy trying to be someone she’s not. Depression is still something she is working through today, but having a wonderful spouse and a strong family support system is helping her get through this struggle. This year, Nicole was nominated by a group of young professionals for an award called the GenXYZ Award that recognizes some of the most influential young professionals in Colorado. She was delighted to be nominated and delighted to be announced among the top 25 finalists for this award. There was a big celebration where the winners were to be announced, and Nicole was thrilled and surprised when she was called up as one of the award winners. This is an exciting success because she was nominated by the community and then selected by an amazing, diverse board of people who read her application, believe in her, and believe she will make a difference in the state. Nicole had the opportunity to travel to Turkey a few years ago, and this was one of the few places in the world that she would love to go back to. Turkey is the seat of civilization, and it was wonderful to see people from so many cultures, sample delicious foods, and see a wide variety of historical landmarks. More recently, Nicole went to Sweden to speak at a bear and whiskey festival there. The craft beer scene in Sweden is remarkable, and she had never considered traveling to the Nordic region of Europe, so this was a really cool opportunity. A tradition in her graduate school lab was creating custom alcohol concoctions to share as shots in 50 ml conical tubes at their annual holiday party. At the Denver Museum of Nature and Science, they do a lot of fun things around Halloween. One year, two people from her team dressed up as Beaker and Bunsen from Sesame Street. They’ve also dressed up one of the teaching skeletons in a lab coat and posed it at the lab bench like it was doing a DNA extraction. As a community lab, they try to incorporate fun and creative elements into what they do. Say yes to the universe. It’s easier to say yes, and when you say yes, doors open for you. To help you overcome your fears, think about the worst possible fictional scenario or outcome (the crazier and more unrealistic, the better!). Then, think of the real worst thing that could happen, which is often what you are really afraid of. Ask yourself if that outcome is something you can live with. If so, go for it! Also, remember that you don’t have to be perfect to be loved. Nicole is a taste scientist and motivational speaker. Her formal training in genetics and microbiology led her to the Denver Museum of Nature & Science where she serves as the Curator of Human Health and directs the Genetics of Taste Lab. Previous studies in the lab have helped to debunk the term “supertaster,” have provided evidence that fat is the sixth taste, and have explored how the human microbiome―the unique group of bacteria in and on each person’s body—affects the way we taste sweet. An ongoing study is using a citizen-science-based approach to better understand how we taste, as well as understand how citizen scientists learn in community labs. In addition to her day job, she is the founder of three companies related to her work studying taste, including the sensory software company DraughtLab. She lives in Denver with her husband, Stewart, and their daughter, Georgia, who motivate her every day to see the joy in life.